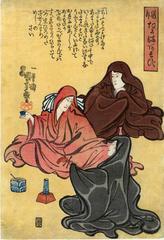 Actors caricatured as Daruma (rare). After the imposition of a ban on actor prints in 1842, Kuniyoshi produced numerous humorous designs with thinly disguised actors’ portraits. In this series, well known actors are portrayed as Daruma, without any mention of their names. This series is listed as number 191 in Kuniyoshi by Basil William Robinson (Victoria and Albert Museum, London, 1961). According to the Kuniyoshi Project this publisher is Hori Masa. There are other prints in this series which carry a different publisher's seal. Marks says that this publisher's seal only appeared in 1849.